Difficult to know where to start when trying to write about this weekend, apart from the fact that we have now been here 4 whole weeks! Finally, it no longer feels as though we are just on holiday, although the joy of being here remains undiluted. It has been a busy weekend! Firstly, this weekend marked one of the big festivals in the diary of the village. La Función de Saleres takes place every year over the last weekend in October to celebrate Santiago Apóstol and la Virgen del Rosario. It is primarily a religious festival, but it combines huge family celebrations, where relatives from Granada and elsewhere descend on the village to party. We haven’t quite got a grip on how such fiestas work, but we did our best. Friday sees the start of proceedings, as a few stalls set up in the small square below the house and a bar and stage are erected in the main village square. Everywhere, there was a palpable sense of anticipation even though there was little sign of the hordes. Not sure what to expect, Andrew and I kept nipping out of the house to do a circuit of the village to see what was happening and where. We ventured out after dinner shortly after 11pm to go to the main square as soon as we heard music, and half expected the entire village to be assembled there in their finery, doing the salsa or some such. We turned the corner into the square to find a maximum of 10 assorted bods clinging to the bar while the live singing trio did their best to coax anyone who was willing to do some sort of dance. It was tricky to try to work out when the big ‘event’ was likely to take place and we remained for as long as we felt comfortable without looking too much like two sore thumbs, and then headed for home. The music continued into the small hours, and I hope that more people gathered to make it worthwhile for the poor band. Saturday was even more eventful. 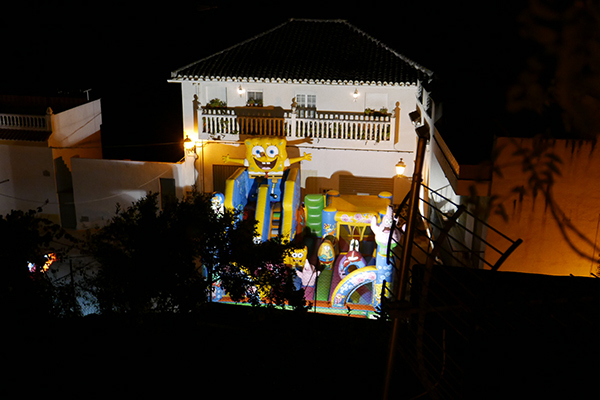 An inflatable bouncy slide, topped by Spongebob Squarepants, appeared in the square below the house. and suddenly, there was Spongebob Squarepants. Which was relaxing. Ian was confident we were going the right way. We had a leisurely morning and then decided to tackle a local walk (see below for more pics). We had a fear that if we drove anywhere, we might return to find visitors’ cars piled into our driveway; a risk we preferred not to take. As it happens, the decision was fortuitous. I had read a tweet about a gorge just to the north of the village and within easy reach. There were suggestions of a route, but it was clear that the walk was not necessarily well-trodden or signposted. We set off, and once on the route, we came across the usual problems - very often, what looks like a well-used track will suddenly peter out into a terrace of olive or orange trees, and all signs of a path disappear. We persevered, and took any track that looked likely, knowing that we needed to head down towards the river bed. Finally, we reached the valley bottom. We believe that the designated walk actually then heads into the valley along the river itself, with the caveats that you get wet and it can be muddy. Preferring to avoid trench foot, we crossed the river and took paths along the far bank and up out of the valley itself. This was hardy walking as there was no path, but platforms of sedentary rock that gave way to large sandy expenses of almond groves. 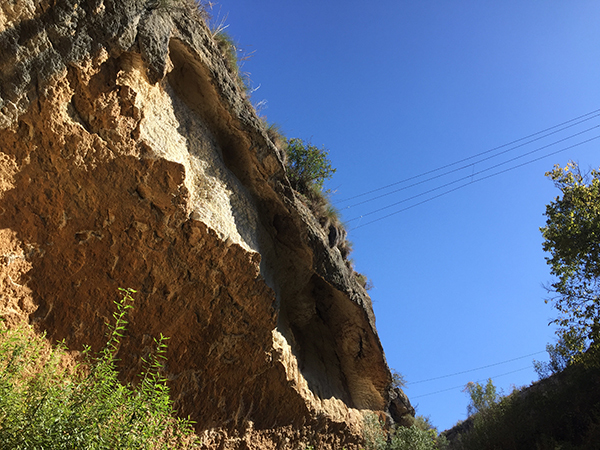 The temperature rose as we got higher above the river, and could see this huge gorge materialising below, where years of raging water had carved huge curves into the cliff face as it coursed its way down from the mountains above. It is surreal to think that this incredible creation of nature was literally on our doorstep and can’t be seen until you are physically in it. Studying the map, there was no way we could clamber down the cliff face to get back onto the path, so we had to continue up the valley until we could find a crossing. As we walked, we passed climbers below, abseiling and zip-wiring across and down the sheer cliff faces. Around us, birds took to the air, and the vast landscape expanded as we moved ever higher. The air was clear and staggeringly bright, and the visibility was exceptional. In here, Ian looked tiny! At the head of the gorge, we hit the road from Conchar to our neighbouring village of Albunuelas, but only for a short time until we ducked down and under the road following another track; the track that would lead us back down the river bed to join the ‘official’ path and then home. Walking back down into the valley was totally magical. It was peaceful, and lush and teeming with birds. The path was easy to follow and clearly defined and it was not long until cliffs loomed on either side. We suddenly found ourselves in the most incredible surroundings - the path opened into a wide terrace of very old olive trees, farmed here for many years. Steps led down past these terraces and into the heart of the gorge and a truly spectacular Tolkien-esque landscape of crystal-clear water flowing through giant boulders, and carved faces of mountainous stone crammed with fossils. If any of you have ever read the novel ‘Picnic at Hanging Rock’, that is the mysticism that came into my mind as we headed into this surreal world. Not that I fancied disappearing never to return! Leaving the valley was much easier than it was entering, and the 3 hour circular walk was worth tackling the sometimes challenging terrain. Saturday night in the village was actually great fun, even though we concede that we have to change our mental clocks completely to fit in! 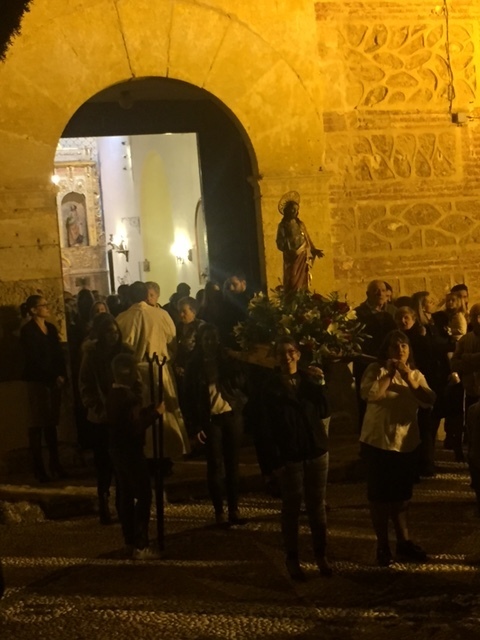 The church bells started to clang at around 8:30, so out we popped to see what was going on, and sure enough, there was an assembly of village residents and families outside the church, and there was activity inside. For the first time, we were able to see the amazing altarpiece and magnificent roof beams in this small, unassuming place. Again, there was a mounting sense of anticipation and eventually two young men emerged from the church bearing lanterns and they were followed by the religious icons representing Santiago Apóstol and la Virgen del Rosario and someone else who looked remarkably like Don Quixote; not quite sure what he was doing there. A brass band completed the procession as it made its way through the village, followed by the massed congregation of villagers, guests and family, conveniently passing the bar in the main square. There is something fabulous but slightly odd about these processions, to people not used to seeing such public religious displays. Yet, such events really unite the village, and everyone seemed to be involved in some way or another and as we passed each house, the doors were open giving us a glimpse into these tight-knit family units normally closed to the public eye and the heat of the sun. Fireworks were then set off at the far end of the village before everyone presumably went to the parental homes for dinner. We took the chance to have our own dinner, priding ourselves that we had suddenly adopted Spanish time - eating at 10pm, so felt sure that, when we heard that musicians begin their set in the main square, we would be able to join the party. This time, there were even fewer people by the bar. 5 men, a couple of whom had clearly been enjoying themselves all day; the stage was dark, the male vocalist on a stool smoking a cigarette. It was close to 11pm, and there was no sign of the 300 or so people who had followed the Virgin Mary and Don Quixote. The toils of our walk were catching up, and we managed a quick cerveza before we thought better of it, and retired to bed. It was then that everyone else's night must have started. The party went on long into the night; incredibly loud bangers were set off at 2:30 am Sunday morning and the band sang for hours!